Wash the brussels sprouts and remove any outer leaves if necessary. Then, using a mandolin, or a slicer attatchment on a food processor, slice the brussels sprouts into thin shreds. Place into a large bowl and set aside. Roughly chop the almonds into whatever size chunks you like. I did mine fairly small, but it's really up to you. Add these to the brussels sprouts, along with the dried berries. Then finely slice the sundried tomatoes and parsley and add these too. 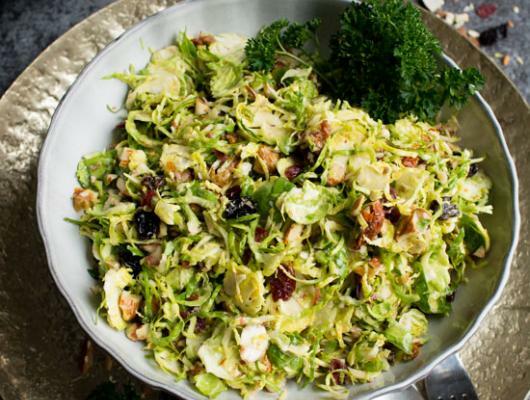 Whisk together all the ingredients for the dressing and pour over the brussels sprouts. Mix everything together well. If you want to serve the salad in an avocado, preheat the oven to 180 degrees Celsius. Cut the avocado in half and remove the stone. Bake on a flat baking tray for around 15 minutes, then spoon the salad into the avocado halves and eat while it's warm! 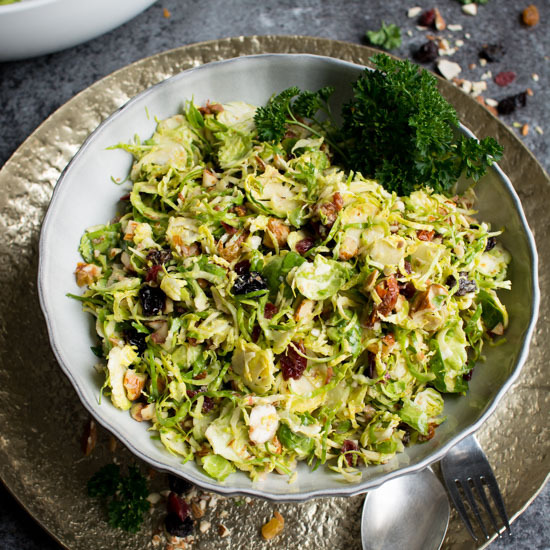 A crunchy Raw Brussels Sprouts Salad with Dried Fruit! RECIPE NOTES Store in an airtight container in the fridge for up to 2 days, best eaten fresh on the day it is prepared.